So there I was. Pedaling underneath the pink skies of Joshua Tree National Park on a nondescript October evening. Although it was the end of a long 70-mile day that had presented upward of 4,700 feet of climbing, the gorgeous desert scenery kept me smiling as I rode along the last few miles into my campsite. Car after car of weary rock climbers and sun-drenched tourists waved and whizzed past on their way home from another day of desert adventures. All of a sudden a red Subaru passes by, just like all the others, but then oddly it slows, pulls into the nearest parking lot, turns around and then waits at the entrance. I could feel the passengers’ eyes on me and so feeling a bit self-conscious, I kept my head down when I pedaled past the idling car. As soon as I cleared the driveway the same little red Subaru pulled up along side of me and the unexpected occurs. I glance over with a ‘who in the world are YOU?’ look on my face and affirm that I am, in fact Sara. “HI!! !” she yells. Still befuddled, I say hi timidly and look to her with a questioning expression. “It’s Chris and Justene! !” she says… after a momentary blank stare, finally, it clicks: Chris and Justene are an amazing duo from Bozeman, Montana who I had been corresponding with via email for the past 6 months regarding our similar bicycle and food-driven projects. These two great folks make up the Human Powered Mountaineers – a project started by Chris that combines alpine climbing expeditions, bicycle travel and organic farms into a single sustainable effort. They just happened to take a road trip that just happened to be to Joshua Tree, and they just happened to be driving back to camp at the same time I was on the road. They recognized my cycling jersey, thought “No way. Could it be her?” and took a chance on yelling out my name. Once it clicked for all of us we pulled over and Justene jumped out of the car to give me a big hug. After countless exclamations of “How random!” I quickly invited them to my campsite and continued to roll through the park as night time approached. They stopped by later and we spent the evening storytelling and marveling over our fortuitous meeting. The next morning they came by to see me off and take a few photos. Please be sure to check out their project and read their account of our serendipitous meeting on The Human Powered Mountaineers blog. 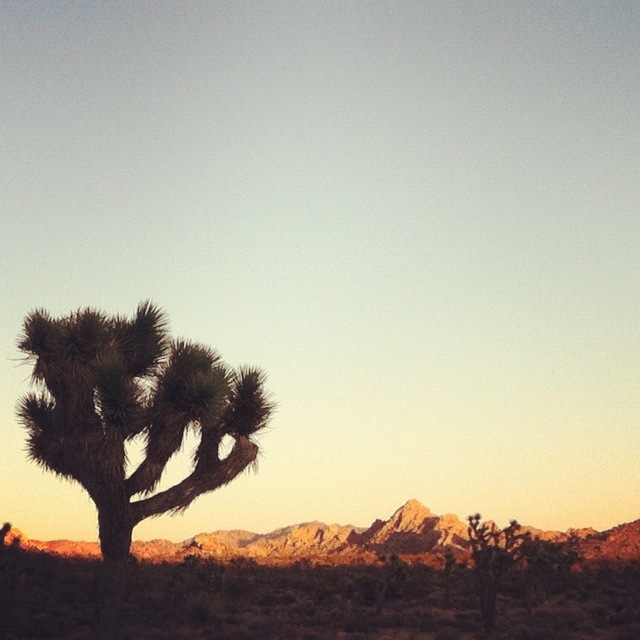 Love the Joshua Tree pics and not surprised you were recognized! Expect more of that! Our best! The DNC! So fortunate to get to see all this scenery and to be recognized for your journey, We hope you have a safe trip !